We’ve already assessed the Pentax K-3 with a wide range of lenses and we’ve now had the opportunity to assess the earlier K-5 II and K-5 IIs. We’re not going to provide an in-depth analysis of the best performing models as we have in the past, as both camera models have now been discontinued. However, the data is now available online for comparison, and it makes interesting reading against the Pentax K-3 if you’re thinking of upgrading. 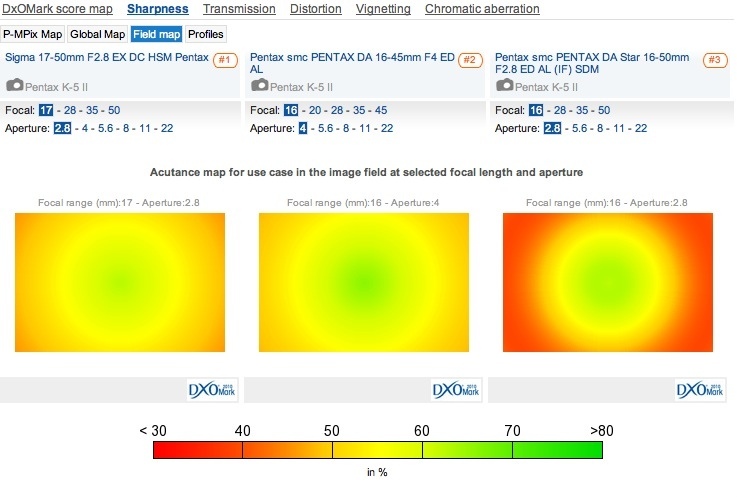 We have analyzed the optical properties of 33 different models overall from both Pentax as well as third-party makers, including 20 prime lenses and 13 zooms. As well presenting the rankings in tabulated form, we were curious to see just how much sharper the results were when comparing the K-5 IIs sans AA filter with the standard (non AA filter) K-5 II, and have prepared the results in two charts. Please note that we’ve not yet had the opportunity to analyze the Pentax 31mm f/1.8, 43mm f/1.9, 77mm f/1.8 Limited models or the 18-135mm f/3.5-5.6 and 60-250mm f/4.0 zooms, however we will be publishing the data on these important models in the future and it will be available online for comparison with the previously analyzed models. 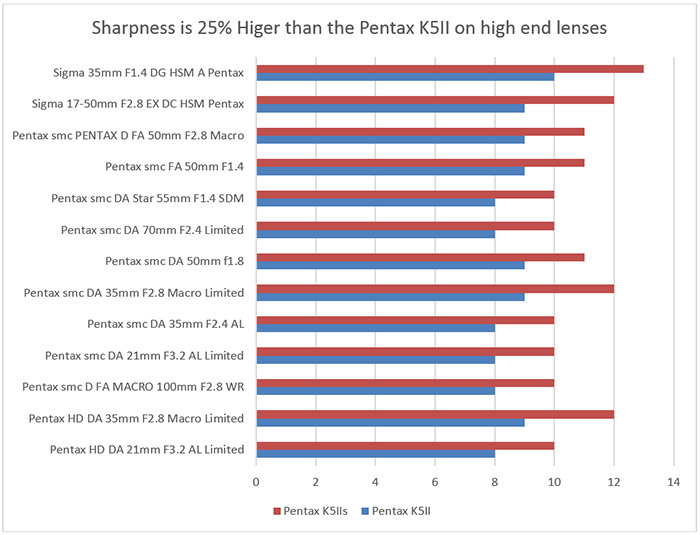 Using our industry standard tests we compared the sharpness data on the best performing lenses between the Pentax K-5 II and K-5 IIs. While the data varies somewhat depending on the lens, we were able to see an improvement in peak sharpness (quantified in P-Mpix as a reduction in image sharpness from the maximum potential of the sensor – in this case 16-Mpix). 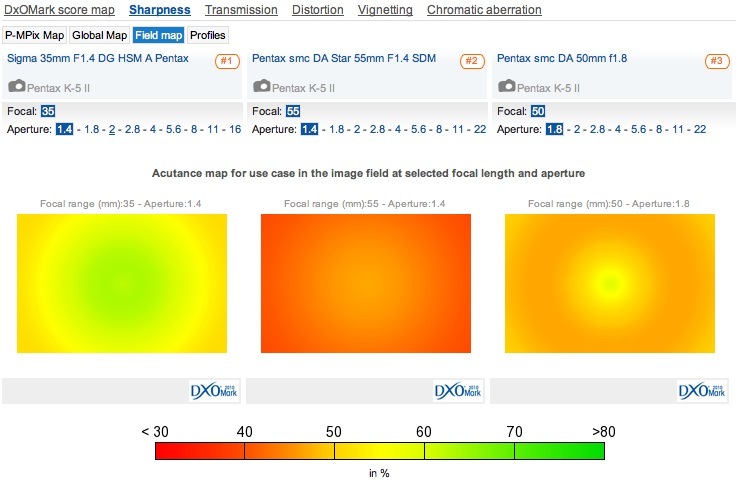 Although the best performing lens was the Sigma 35mm f1.4 DG HSM A, which achieved a peak sharpness figure equivalent to just under 13P-Mpix on the Pentax K-5 IIs, and 10P-Mpix on the K-5 II – all of the lenses listed above achieved an increase of 25%. 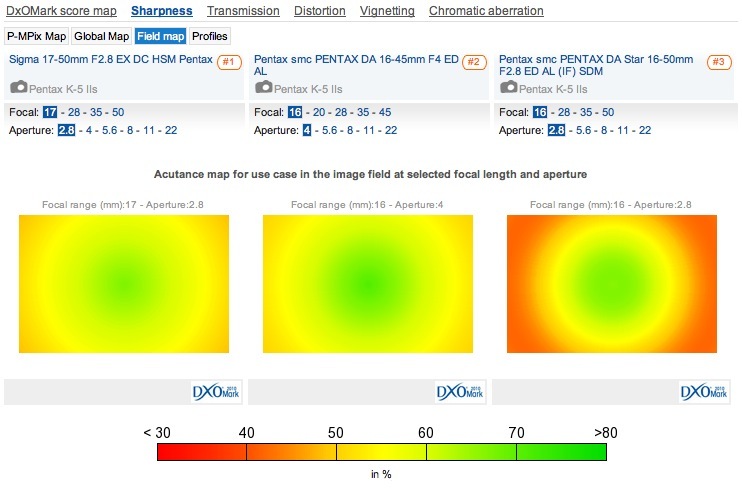 If your lens isn’t listed, you can compare the data online. 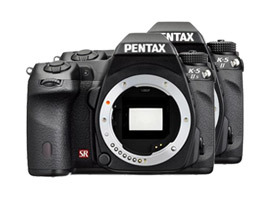 We were curious to see how well the 24-Mpix Pentax K-3 would compare against the Pentax K-5 IIs using the same lenses. In the event, were somewhat surprised to find that difference between the two amounted to around 10%, which is still significant though perhaps slightly less than we expected. The one exception to this was the outstanding Art series Sigma 35mm f1.4 DG HSM A, which saw a improvement of just over 23%, but it’s clear this lens is optimized for sharpness. As we’ve seen with other makes the Sigma 35mm (54mm equivalent) f/1.4 DG HSM A is the best performing lens of its type. Not only is very well corrected but it also achieves the highest peak sharpness score out of all those tested. In second place is the highly regarded Pentax smc DA* 55mm (85mm equivalent) f1.4 SDM, another well corrected model though with lower sharpness. That’s bettered by the smc DA 50mm (77mm equivalent) f1.8 version in sharpness, but it’s negligible in real world terms, but’s a good choice if on a budget. Sigma also does well with the 17-50mm (26-77mm equivalent) f2.8 EX DC HSM in the zoom category. It’s also well corrected and has high peak sharpness when stopped down. Full aperture performance isn’t bad either, but it’s better at the longer end. In second place is the moderate speed Pentax smc DA 16-45mm (25-69mm equivalent) f4 ED AL a good all round performer with a useable maximum aperture. This is followed very closely by the Pentax smc DA 16-50mm (25-77mm equivalent) f2.8 ED AL (IF) SDM in third place, but sharpness at the initial aperture is somewhat disappointing at the longer end even on the K-5 IIs. 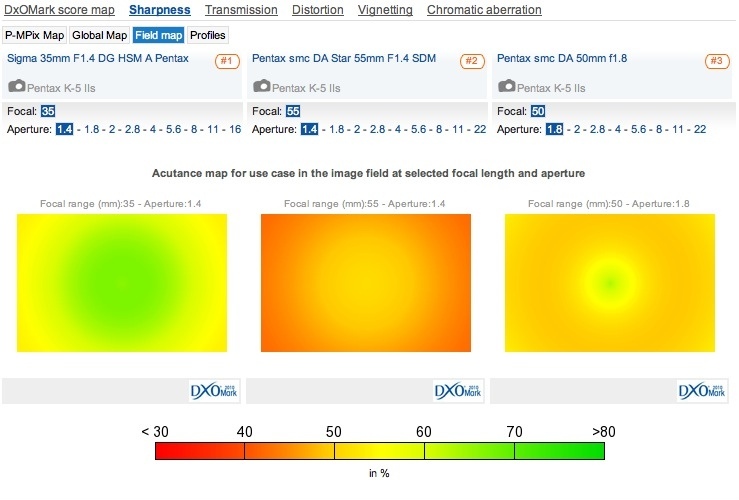 Although the lenses follow similar rankings on the K-5 II with the same models occupying the top three positions, there are some slight differences. The most notable of those being the Pentax smc D FA Macro 100mm f2.8 WR, which dropped from fourth place to ninth and the smc DA 70mm f2.4 Limited, which fell from fifth to tenth place – both those models perform well on the K-5 IIs. 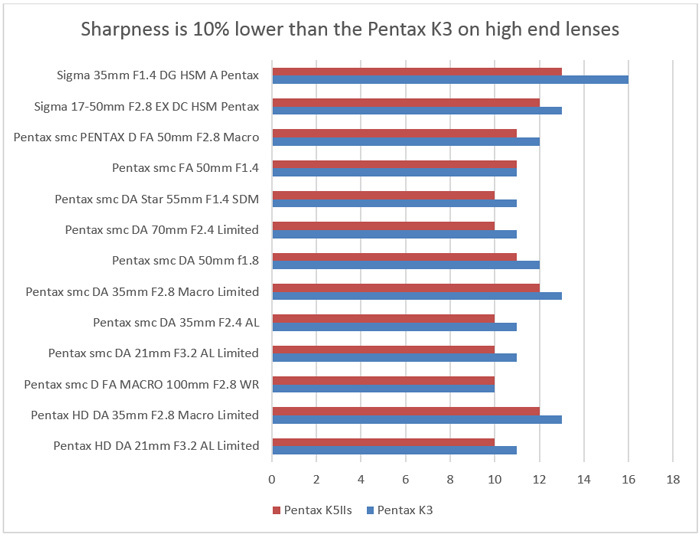 On the Pentax K-5, the zooms have near identical rankings with the K-5 IIs, though, naturally, with lower sharpness. The three best performing models retain their position, but the Sigma 17-50mm f2.8 EX DC HSM and the smc DA* 16-50mm f2.8 ED AL (IF) SDM show greater promise on the K-5 IIs than most others with regard to sharpness.